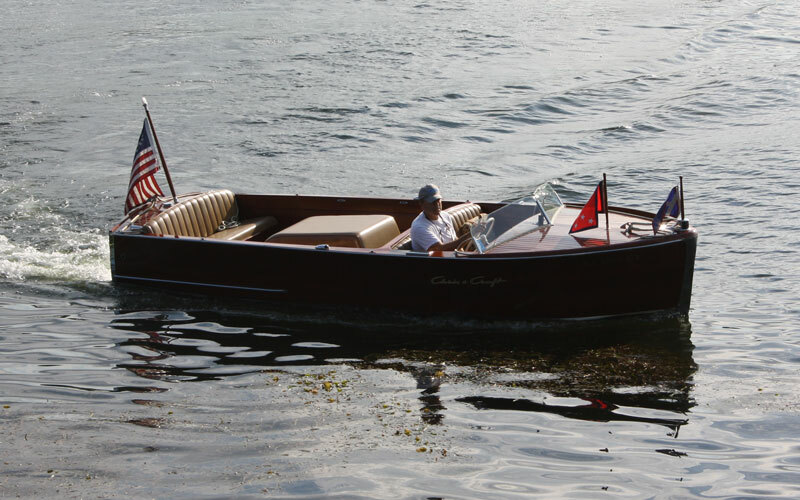 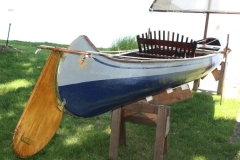 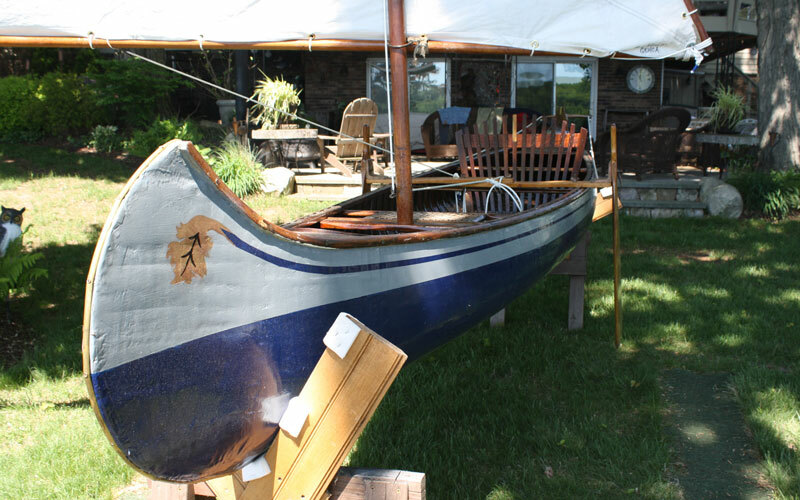 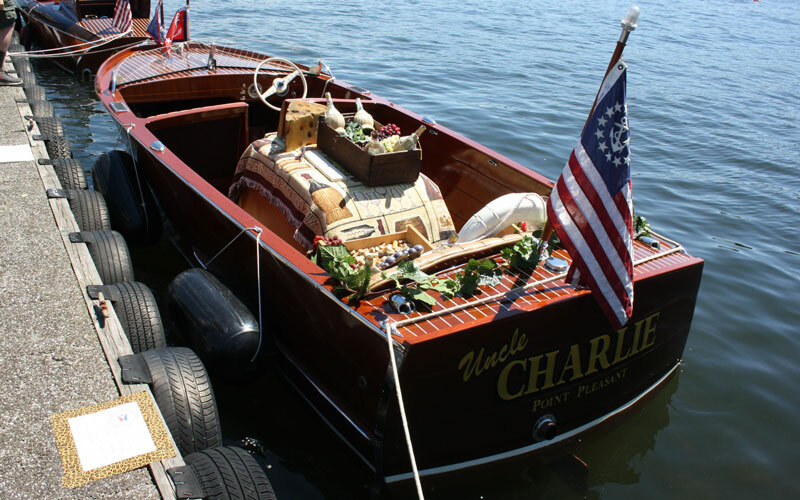 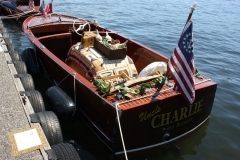 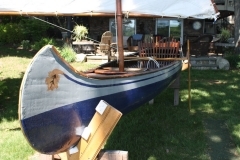 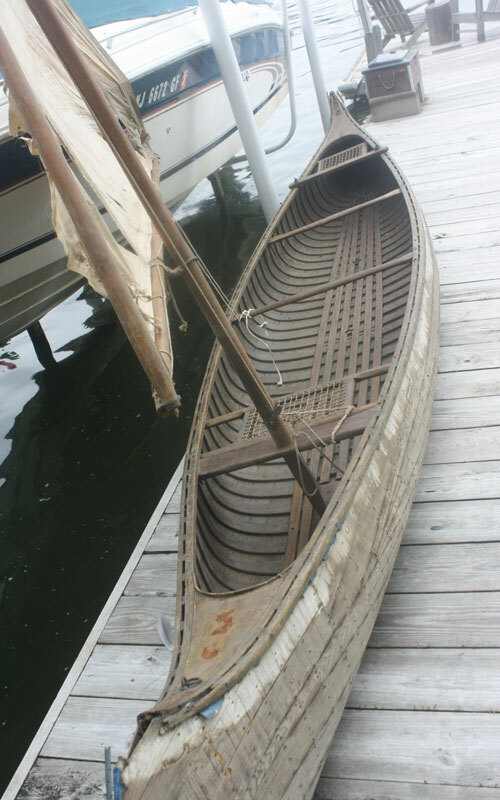 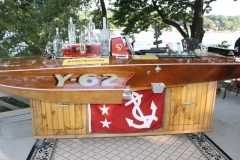 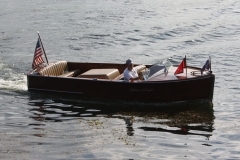 Our first antique boat, a gift from Cindy’s Godfather Uncle Charlie (with the help of Cindy’s brother, Bill Doyle) to Kenny on his Birthday in 2004. 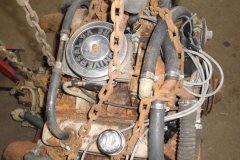 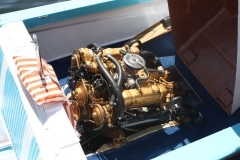 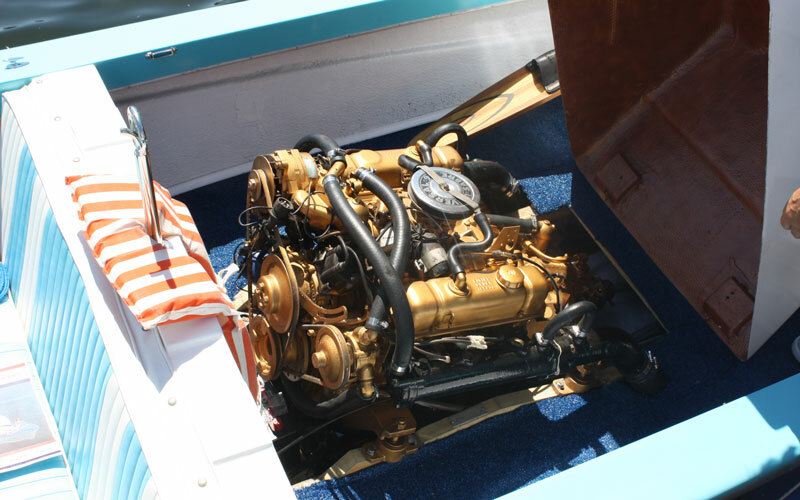 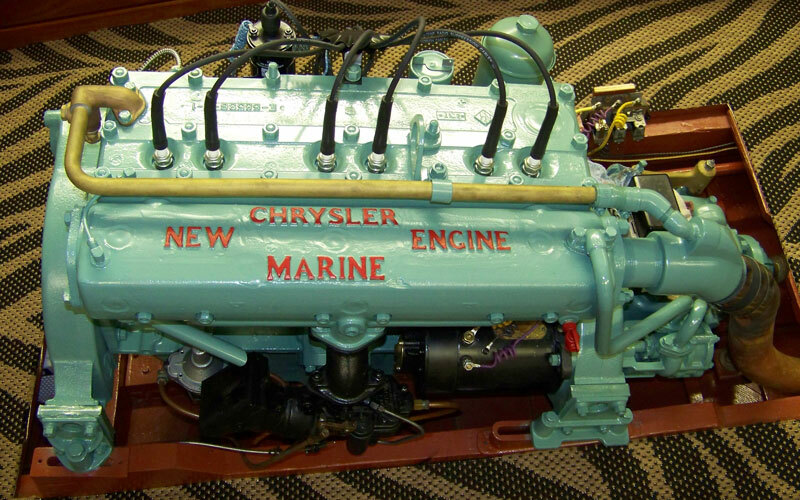 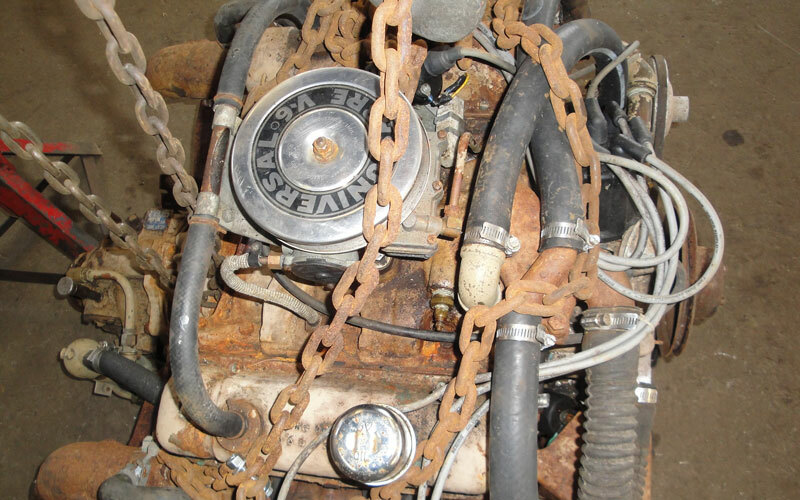 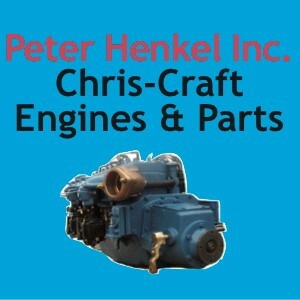 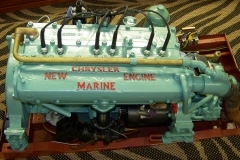 Obtained new engine to match hull, 1947 Chrysler Ace. 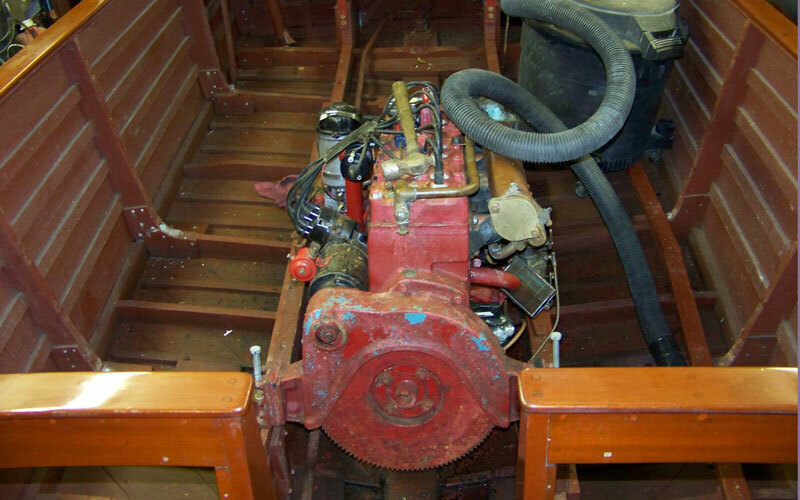 Mini-restoration including zebra carpeting (Cindy) in 2007. 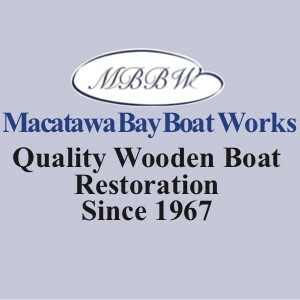 From Katz Marina as a gift from Seth Katz when he acquired the marina. 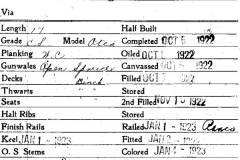 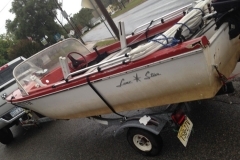 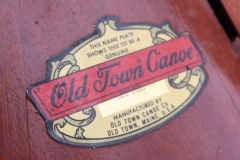 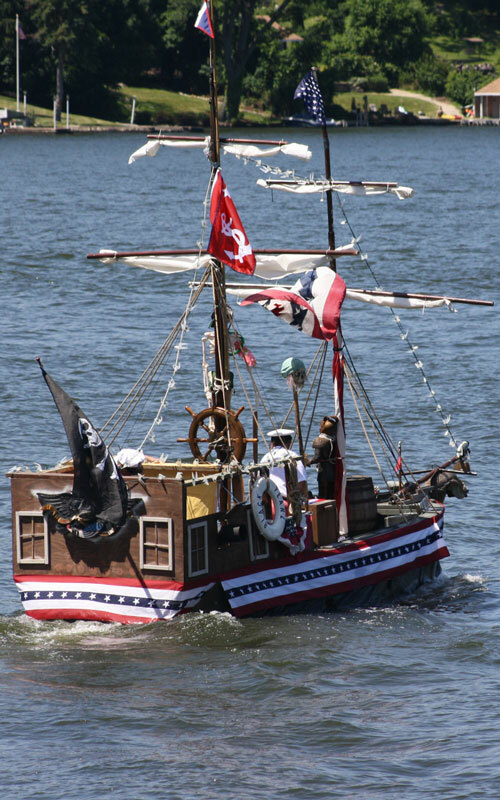 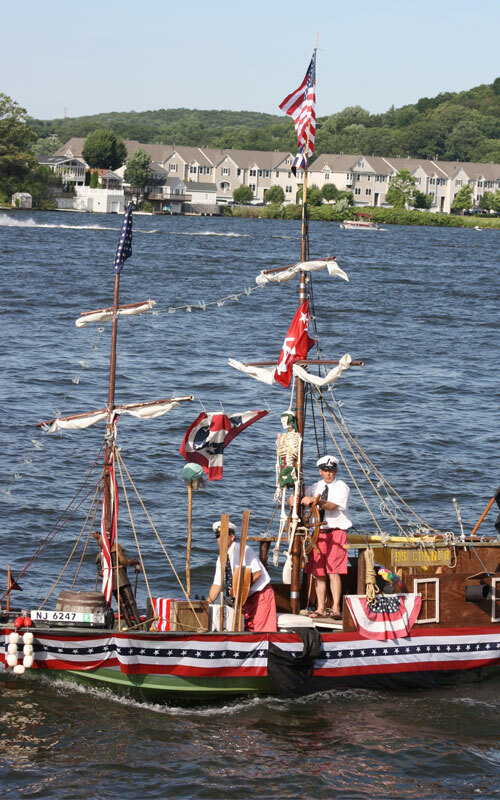 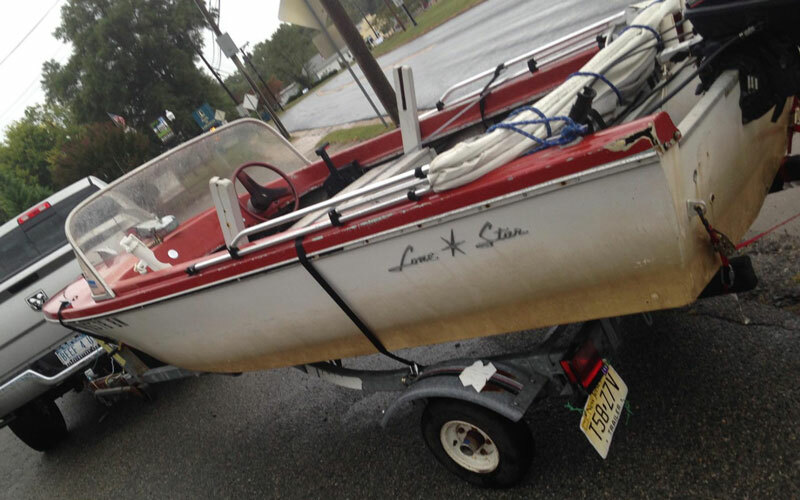 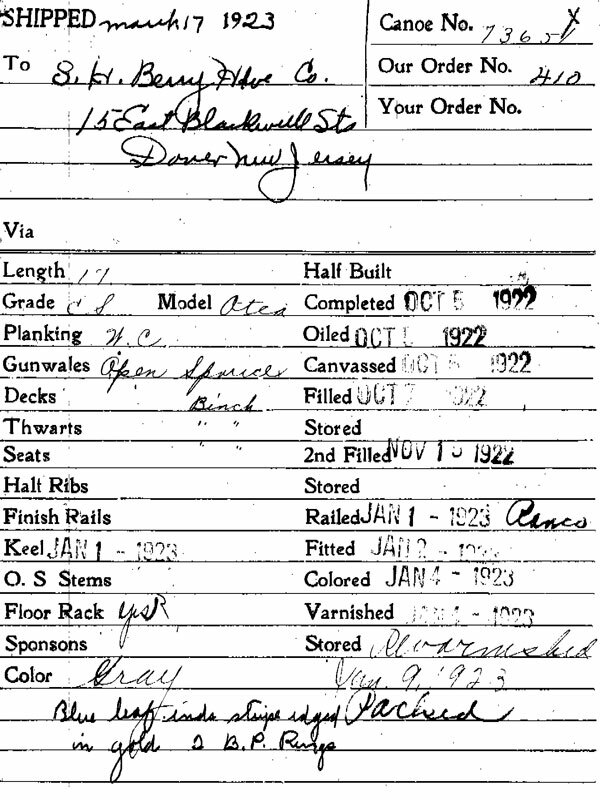 Traced origin to Dover, NJ and quite possibly was Kenny’s own father’s boat in the 1940’s (94 years old and still living in Dover, NJ). 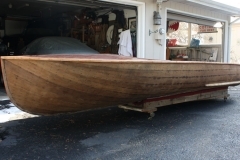 Sail material donated by 1905 Herreshoff NY 30 Amorita, Newport, RI. 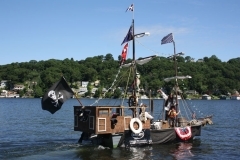 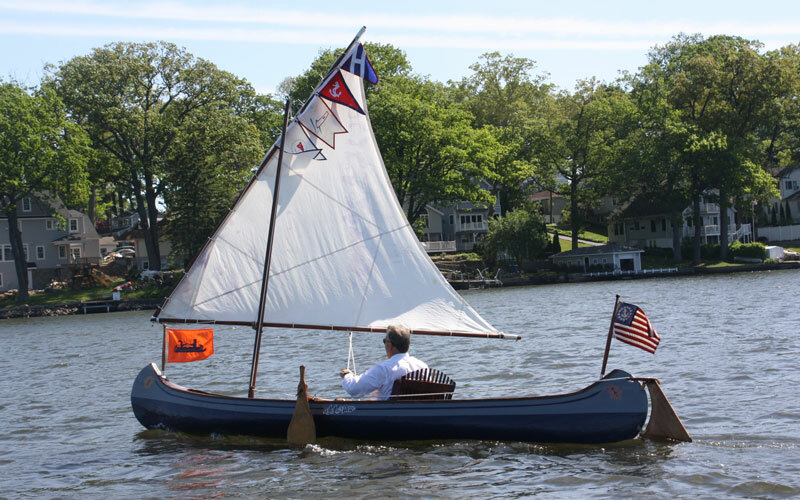 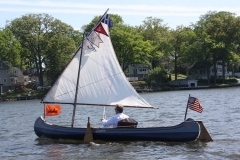 Ken sailed it in an All-fleet Regatta at Lake Hopatcong Yacht Club in his Past Commodores uniform. 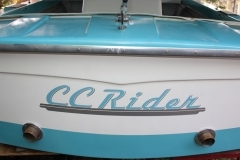 Gift from long-time friend Sam Hoagland as he moved to sunny FL. 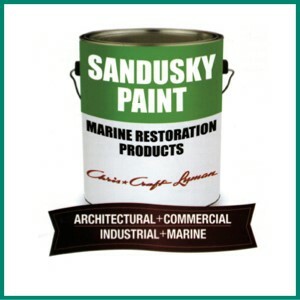 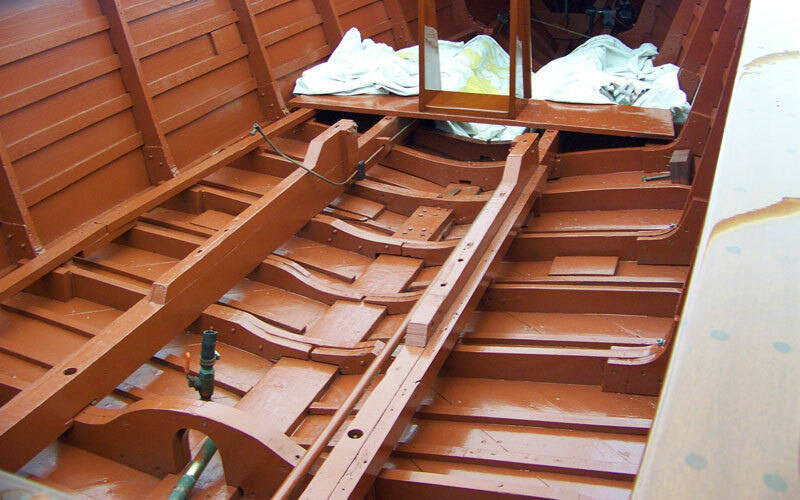 Was in great shape, repainted hull and varnished interior. 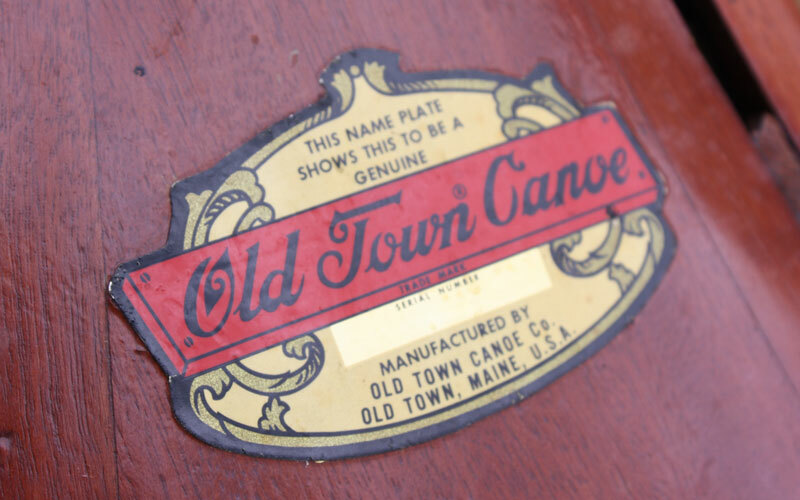 Acquired while purchasing a 1950’s glider chair from an estate picker on Green Pond. 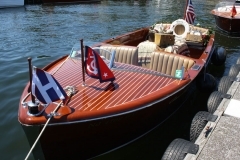 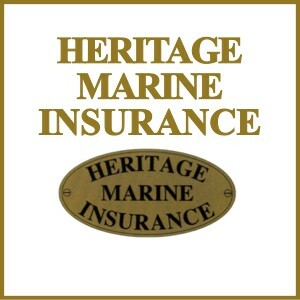 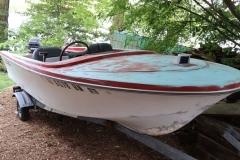 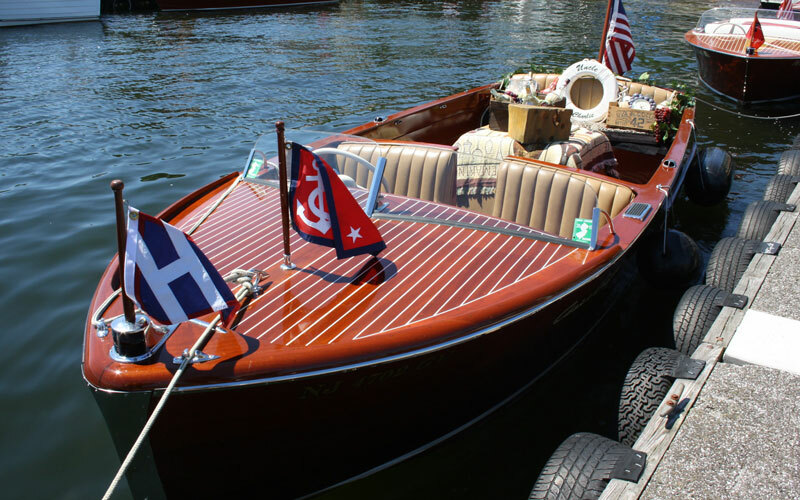 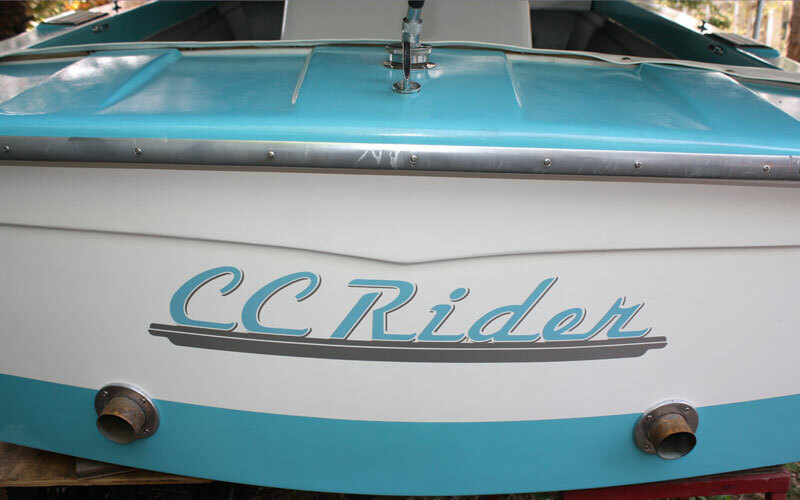 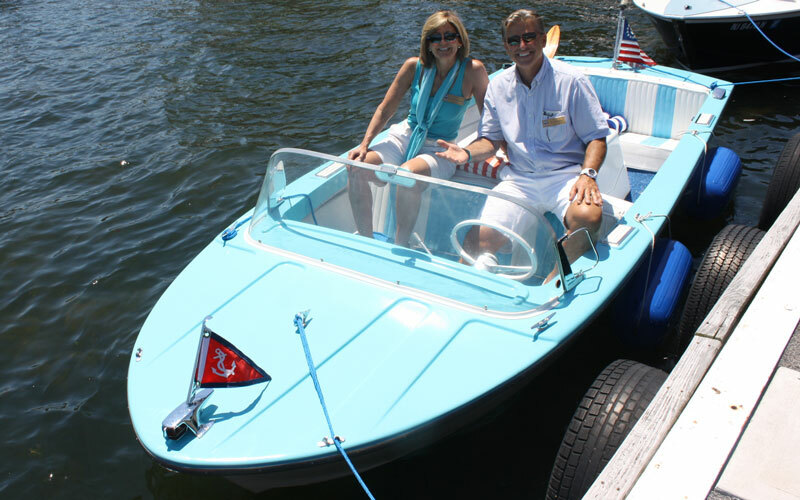 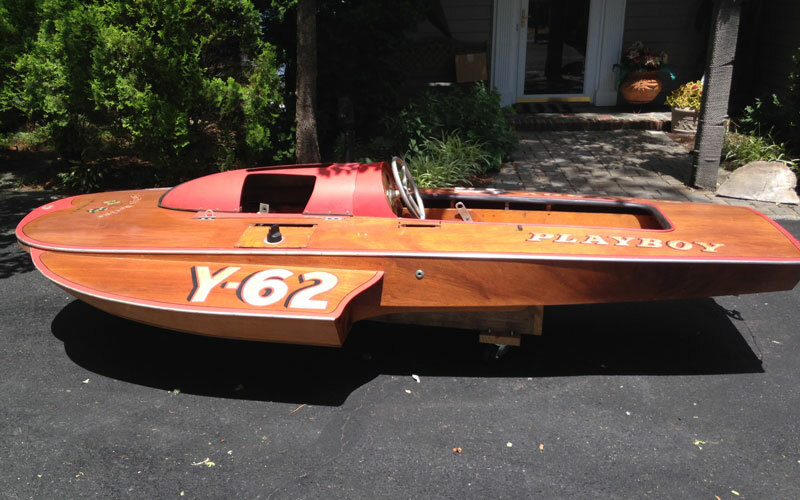 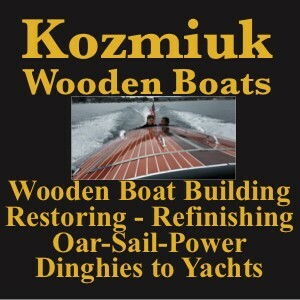 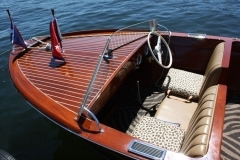 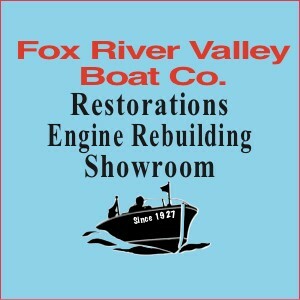 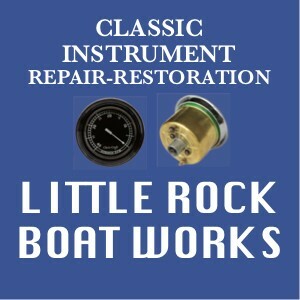 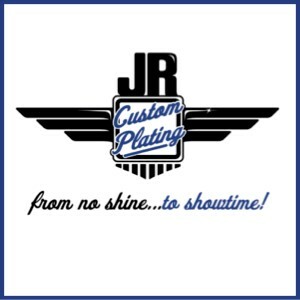 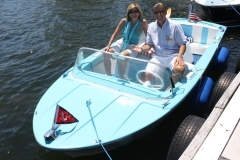 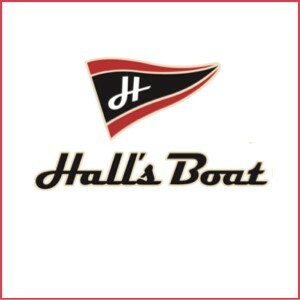 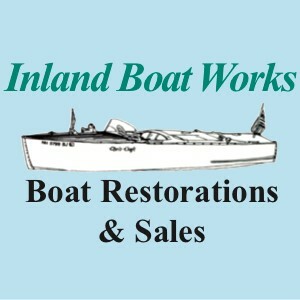 Rick Nerger gave to Kenny to restore for annual Boat Show. 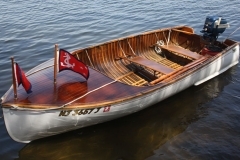 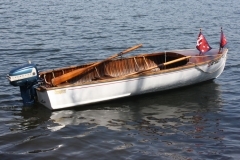 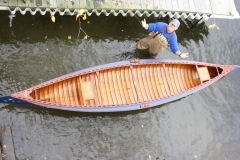 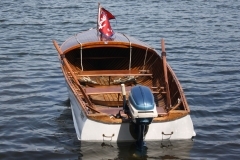 Mahogany-decked bow with white oak on a cedar hull. 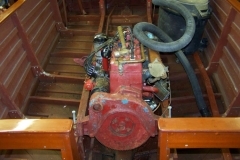 Painted hull, new engine 2011/2012. 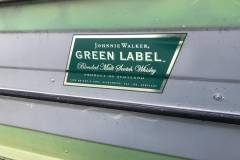 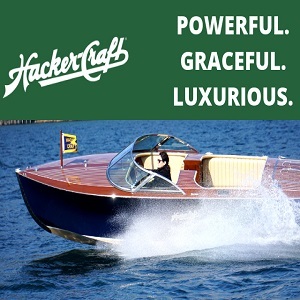 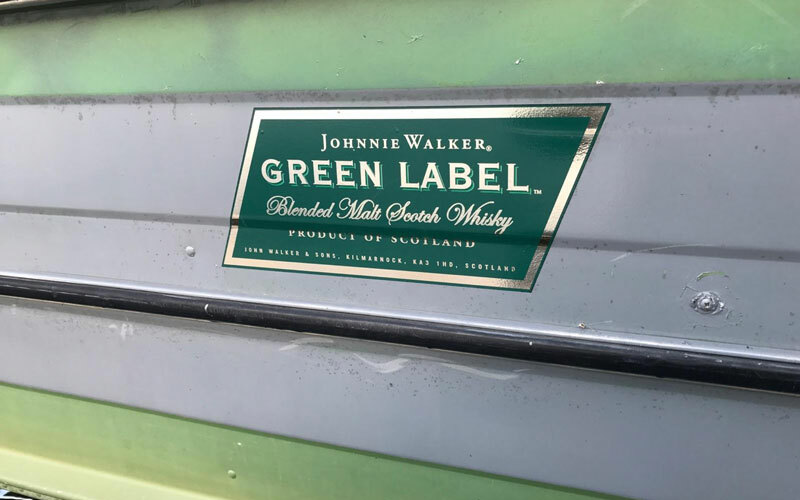 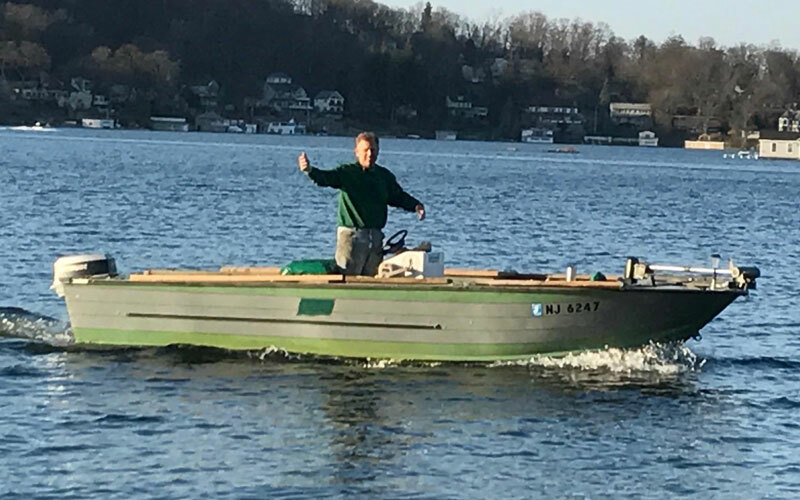 An innocent evening of cocktails with longtime ACBS member Steve Sher at his home, then Kenny spots a boat on his property. 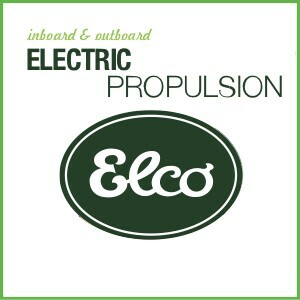 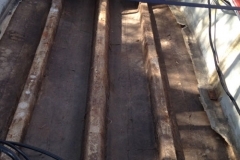 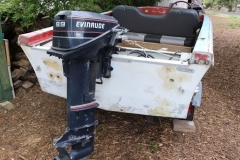 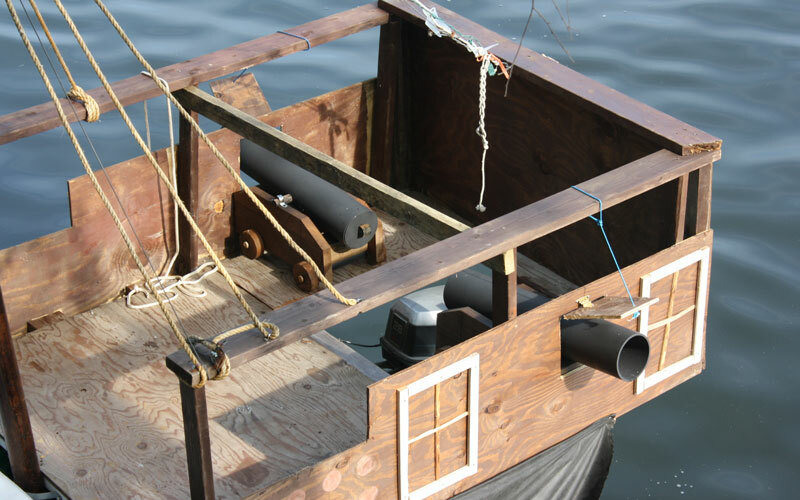 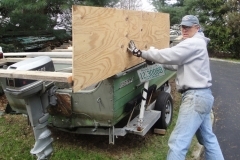 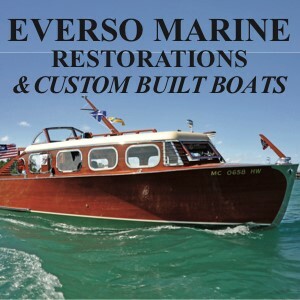 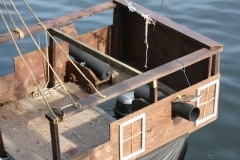 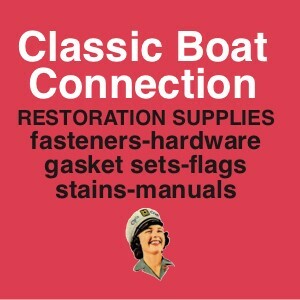 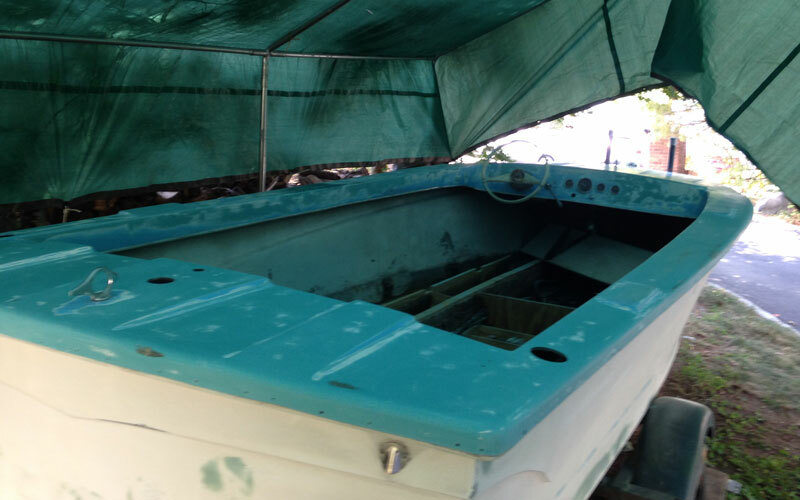 Steve donated the boat and all boxes of parts, as he was never going to get to the restoration. 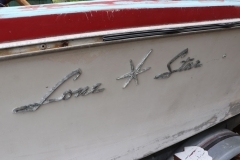 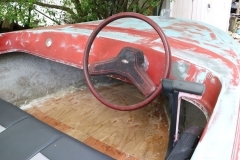 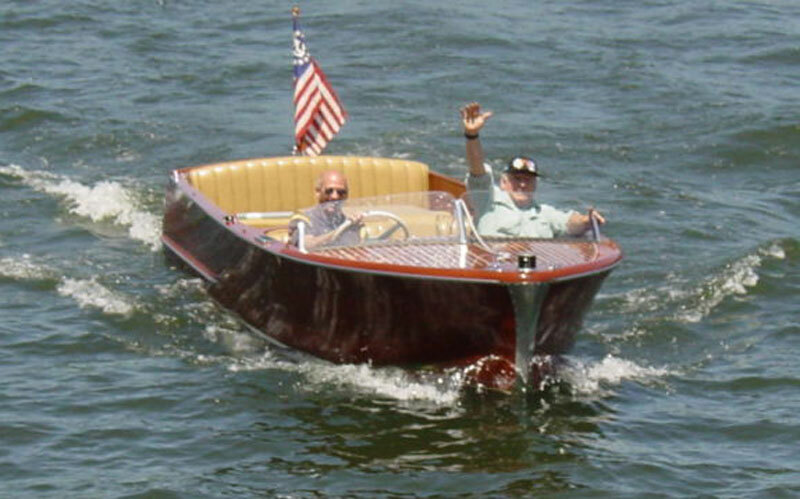 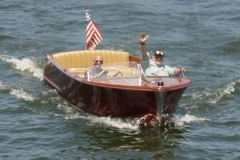 Replaced stringers, did fiberglass work and took road trip from NJ to Illinois with Uncle Charlie (the man, not the boat) for $1,500 replacement engine (Buick Super Sabre V-6) Now the FREE boats are adding up. 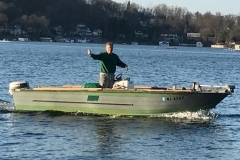 This one ended up on our mooring as Uncle Charlie (the man) needed to replace a blown engine, and the only engine he could find came with an unnecessary boat and trailer! 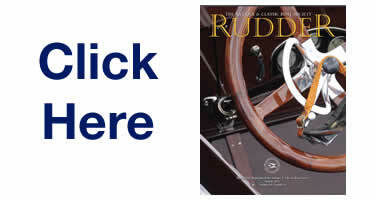 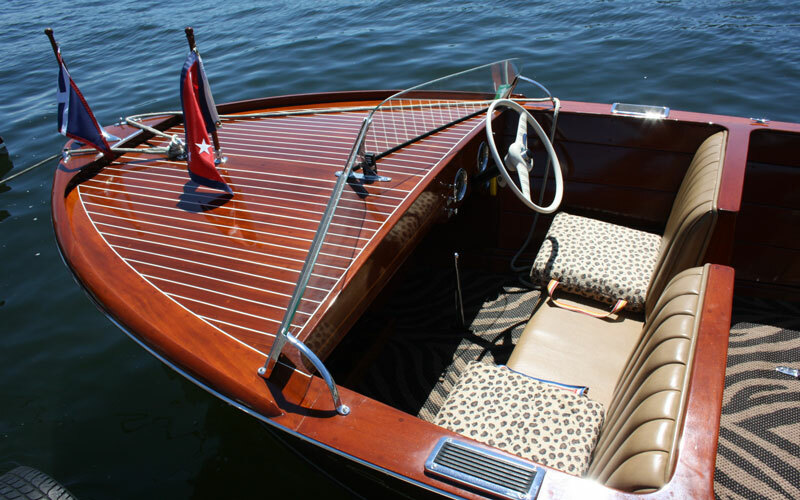 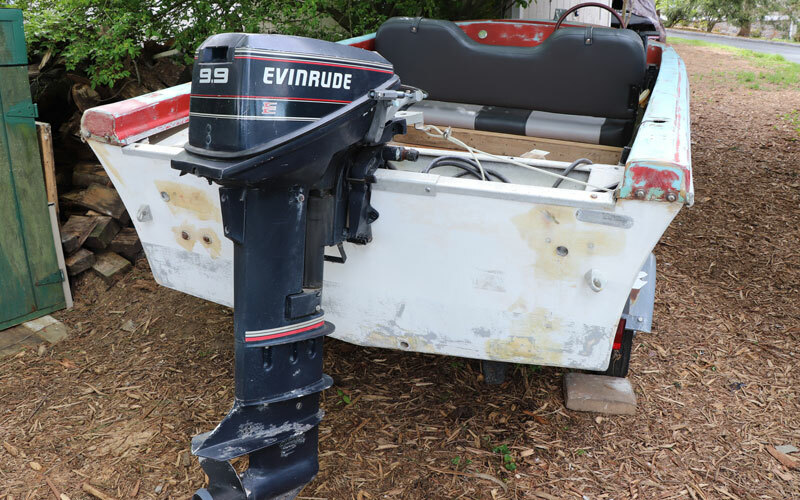 This center console has most famously been outfitted multiple times as the Lake’s Pirate Ship. 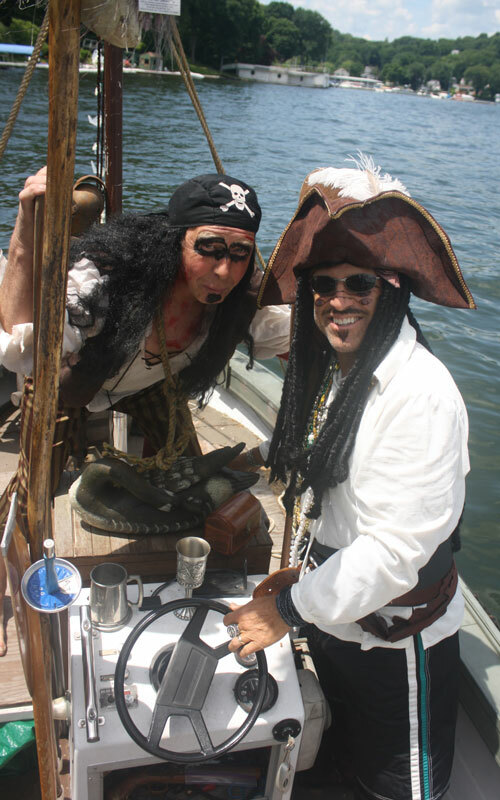 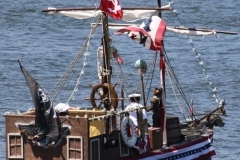 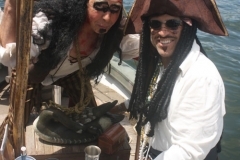 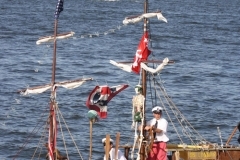 Complete with wench, first mate, and Cap’n Jack Sparrow himself! 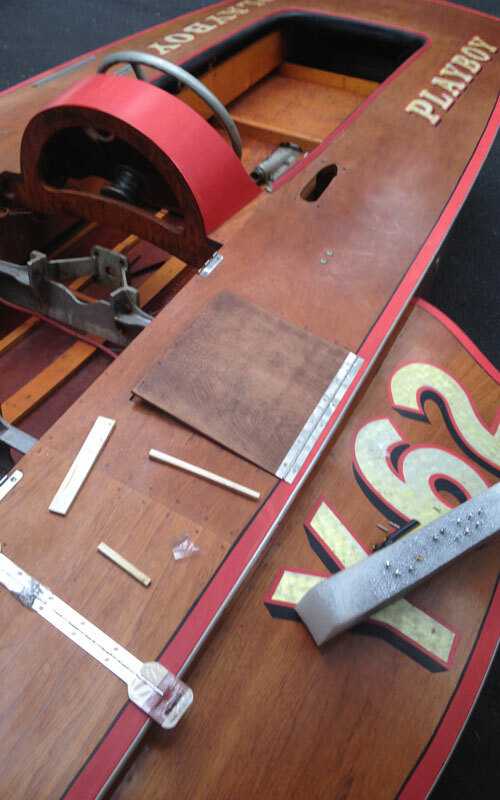 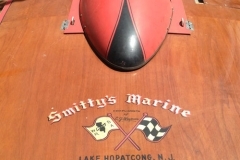 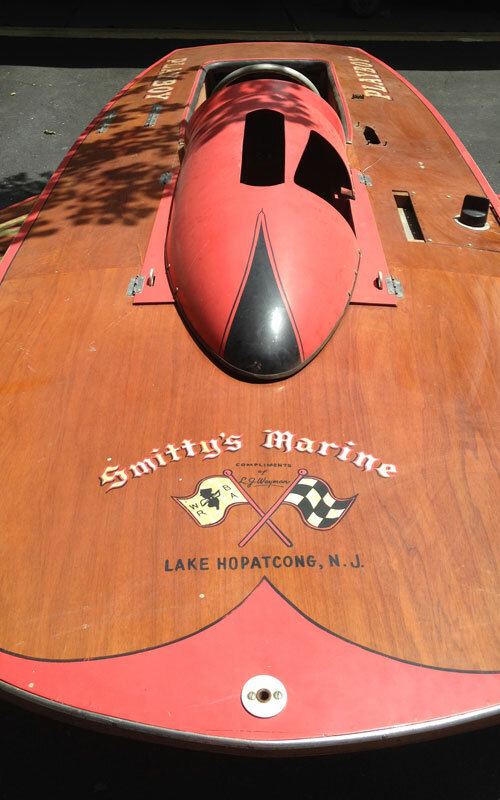 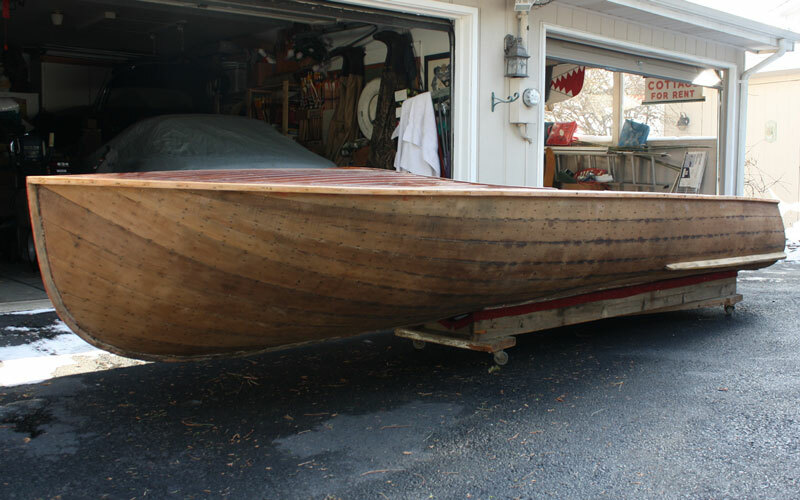 Originally a racing hydroplane from Smitty’s Marine, this was acquired recently from Tommy Bush while he was cleaning up a warehouse of nautical treasures. 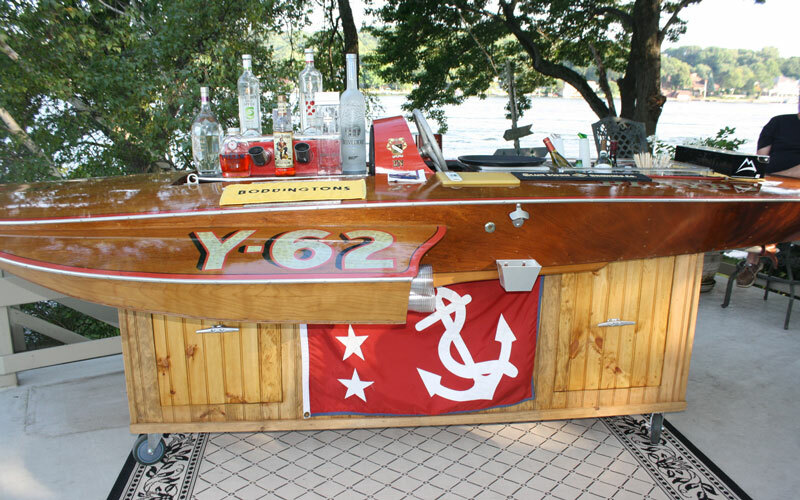 It is currently in use as a Bloody Mary Bar, beer tap, on a wheeled base. 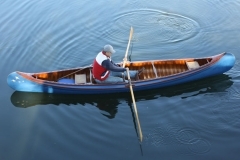 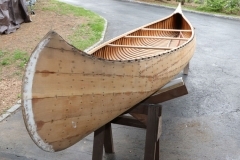 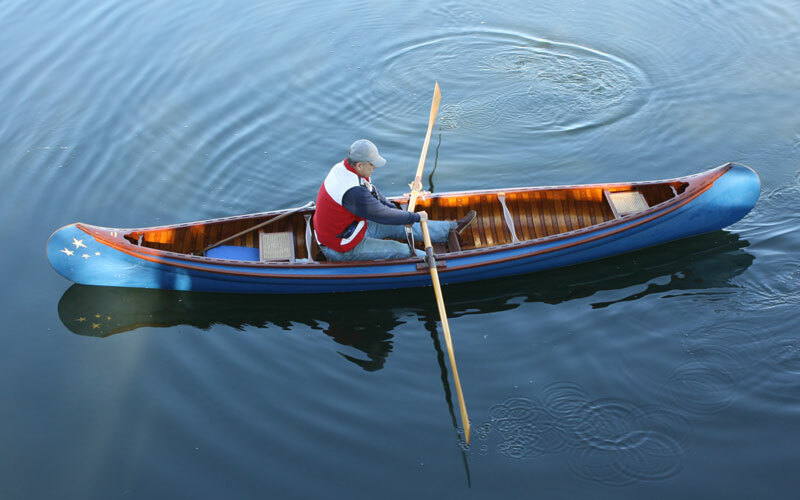 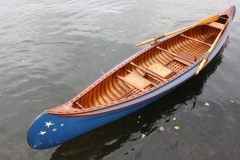 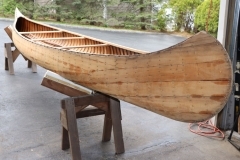 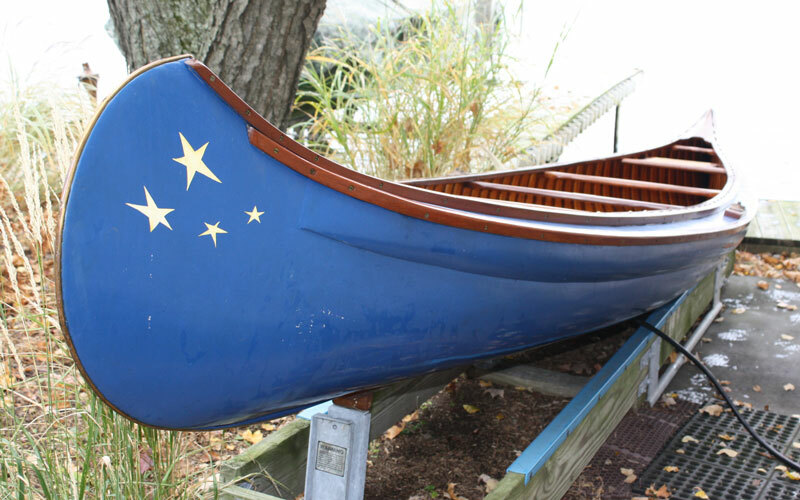 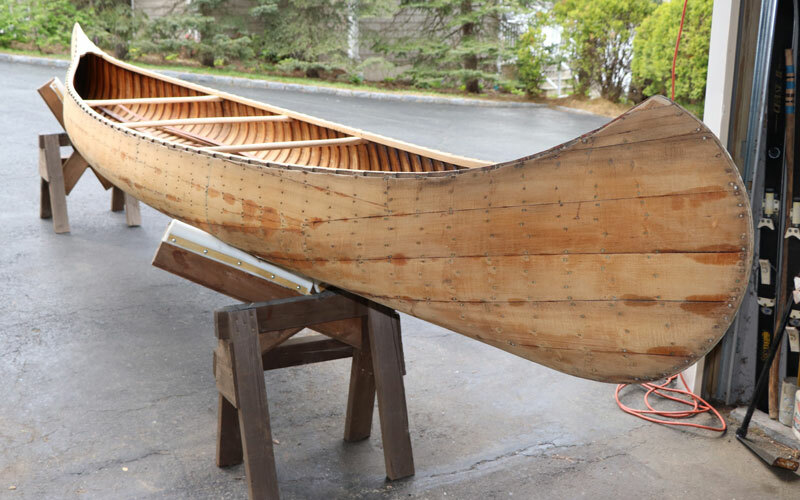 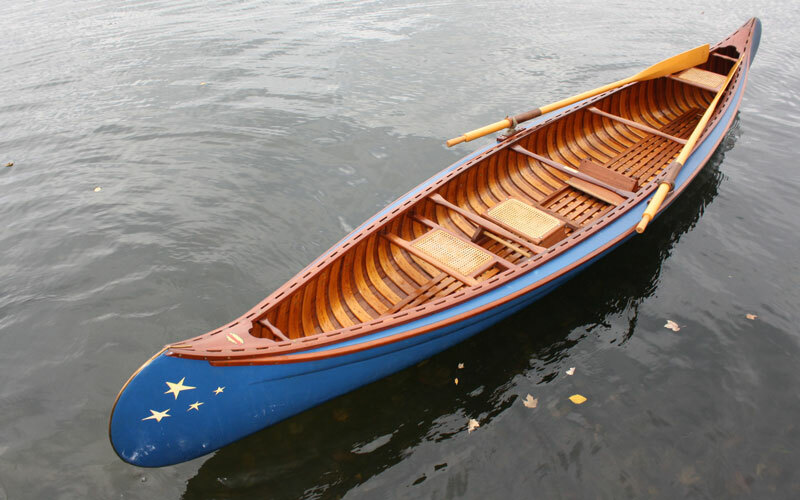 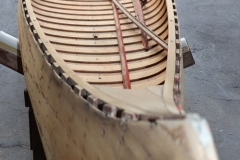 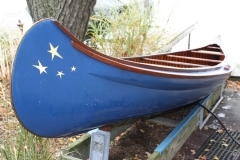 Friend Sam McMillan needed space and donated canoe to Kenny. 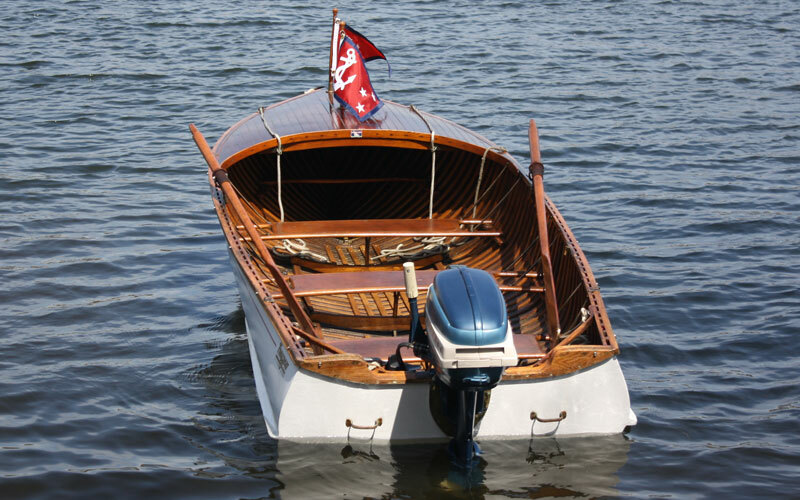 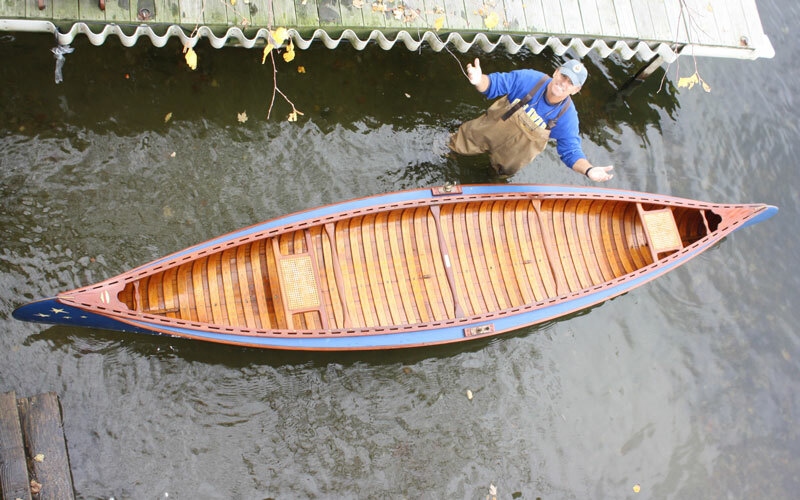 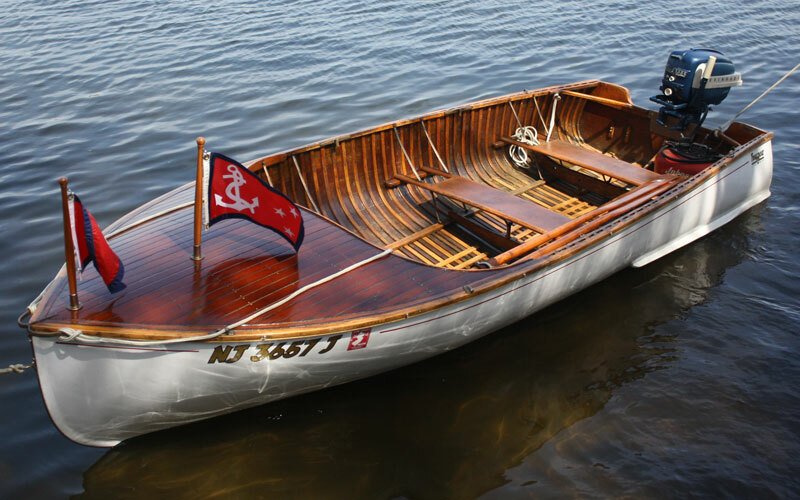 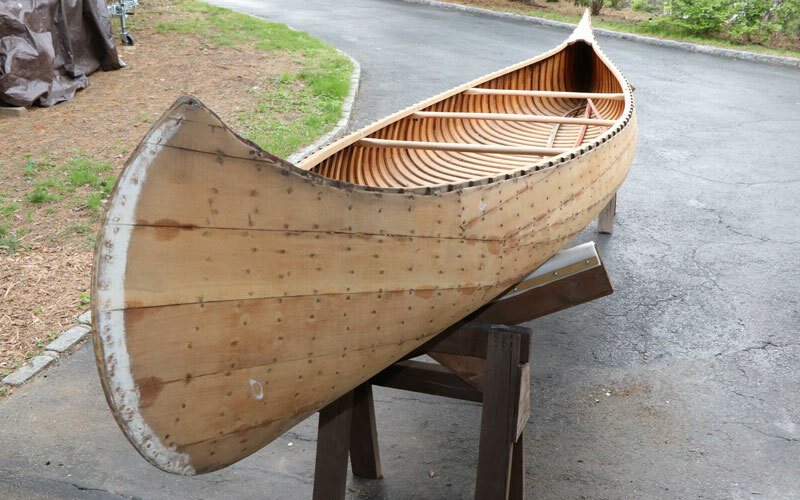 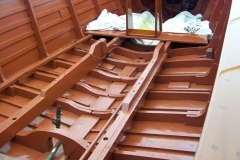 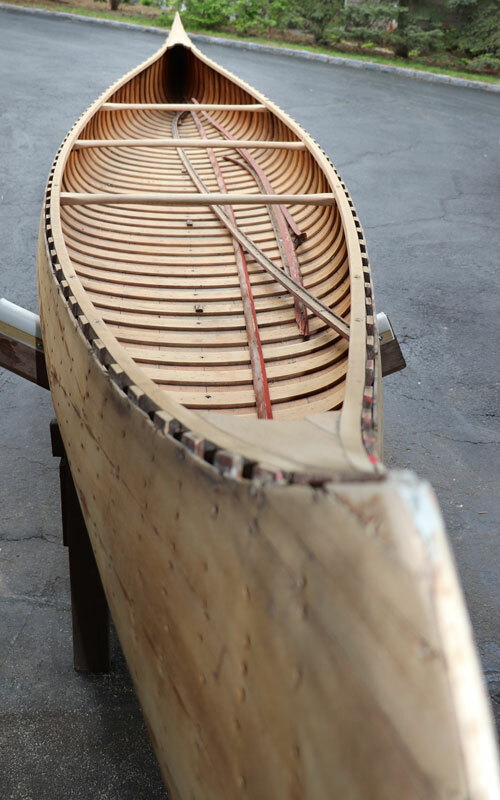 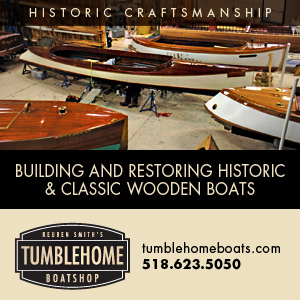 Replacing canvas and Out gunwales, restringing cane seats, paint (Princeton Orange w/black stripe) and varnish are on the current schedule. Another Road Trip with Uncle Charlie (the man) to retrieve this gift from friends Elinor & Herb from the Chesapeake. 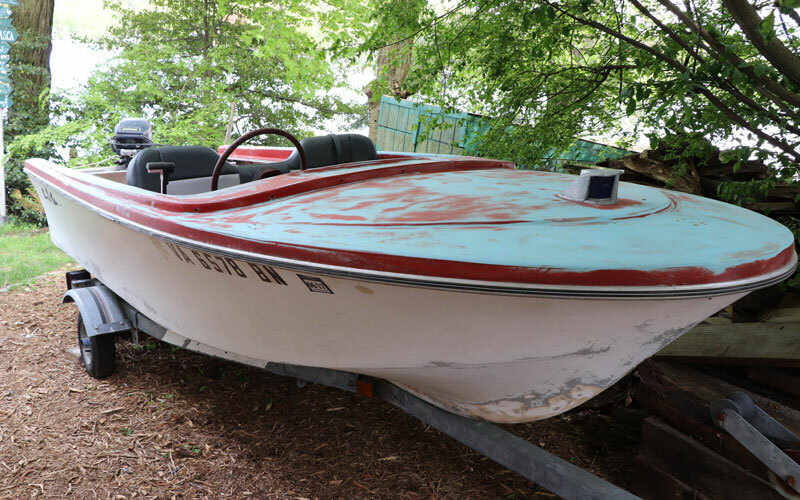 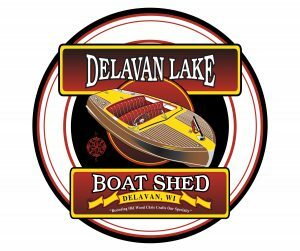 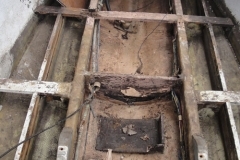 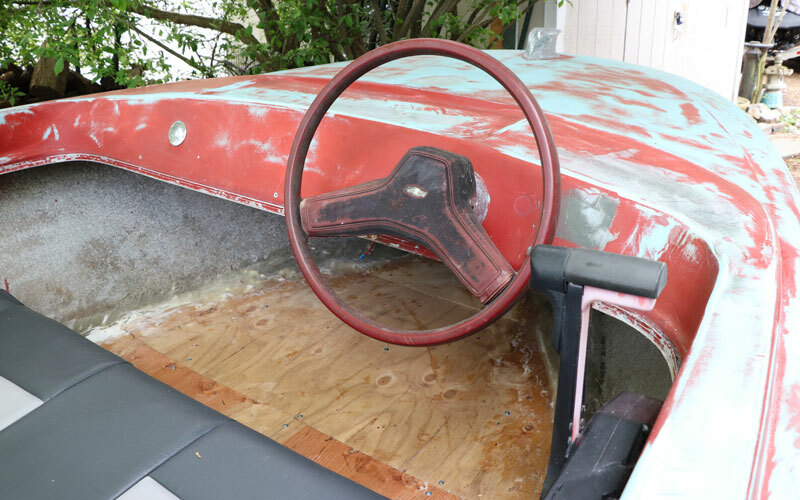 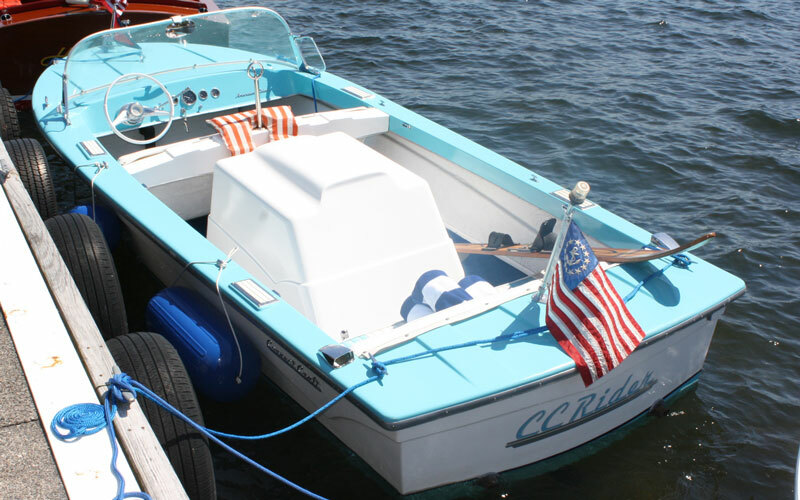 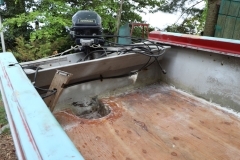 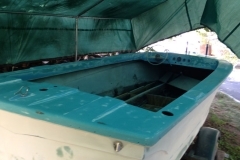 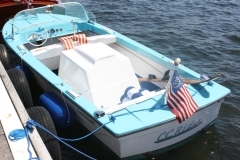 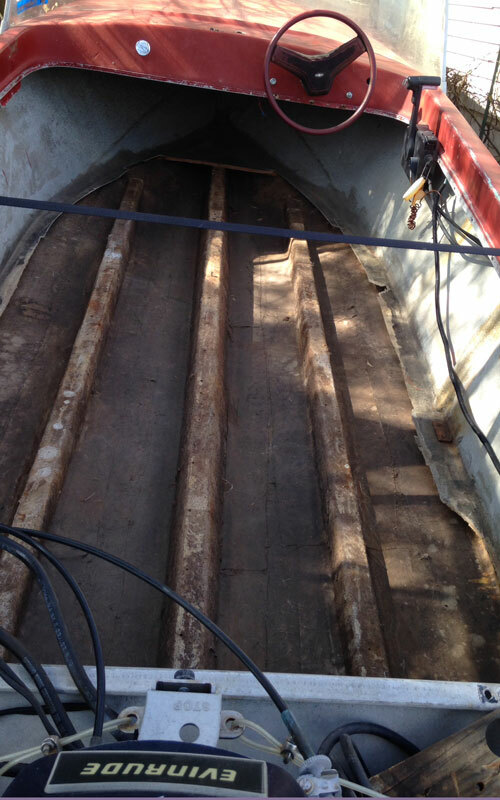 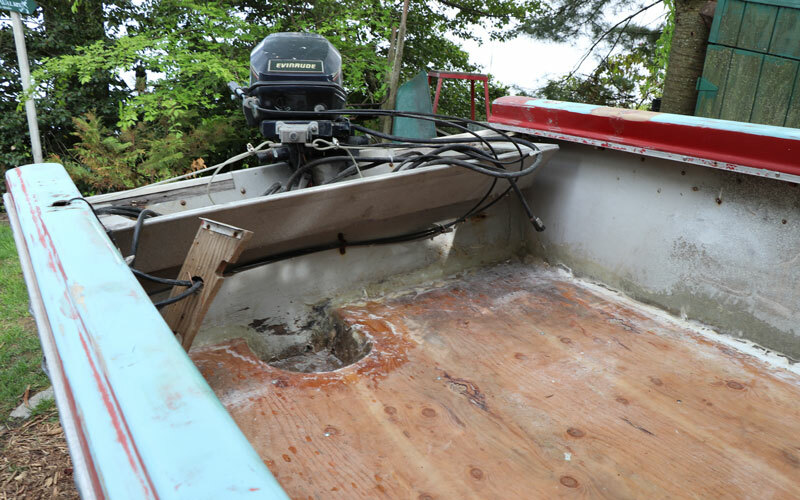 Originally red, plans for this boat are to paint seafoam green after fiberglassing, replace flooring after repairing a 10” hole in hull, and find new seats. 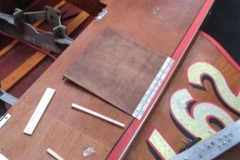 In progress. 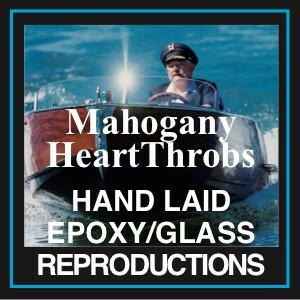 We are enjoying telling everyone that we named the boat After You. 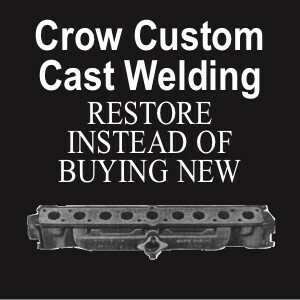 They are all so flattered! 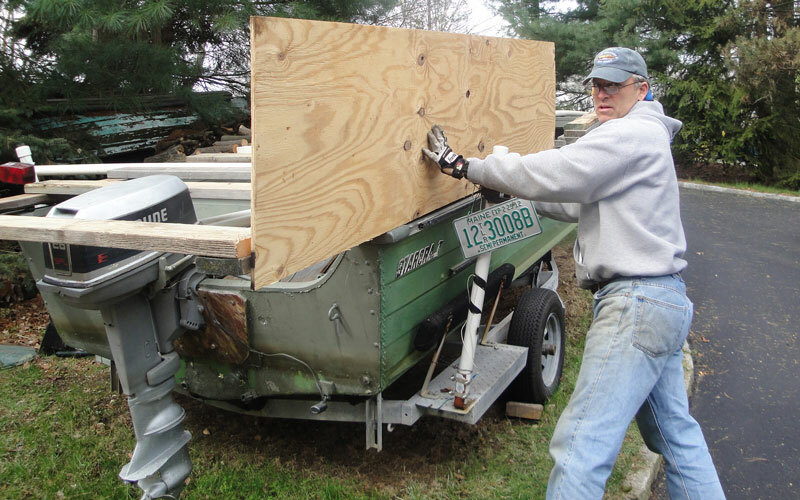 Finally, one that was destined for the chainsaw. 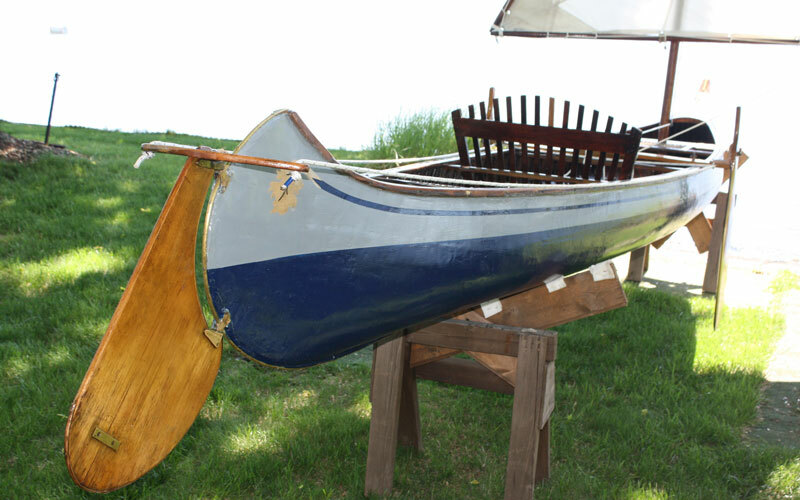 But guess who rescued this one for a soon-to-be-planter in the yard? 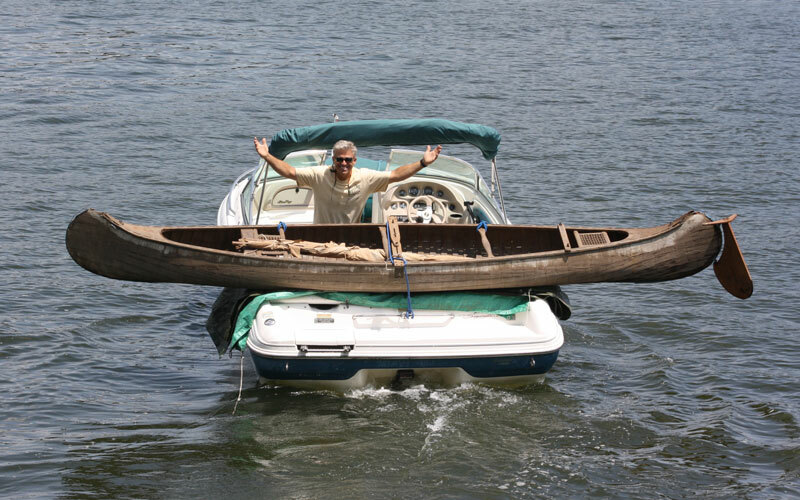 This one wasn’t Kenny’s idea. 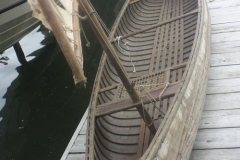 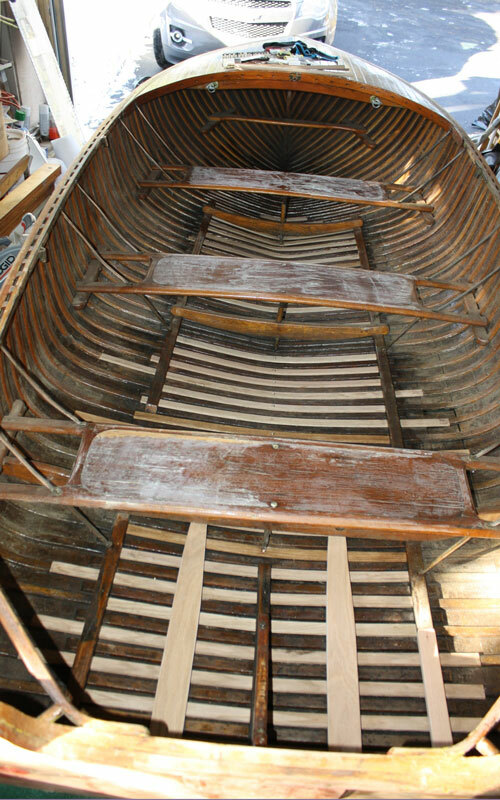 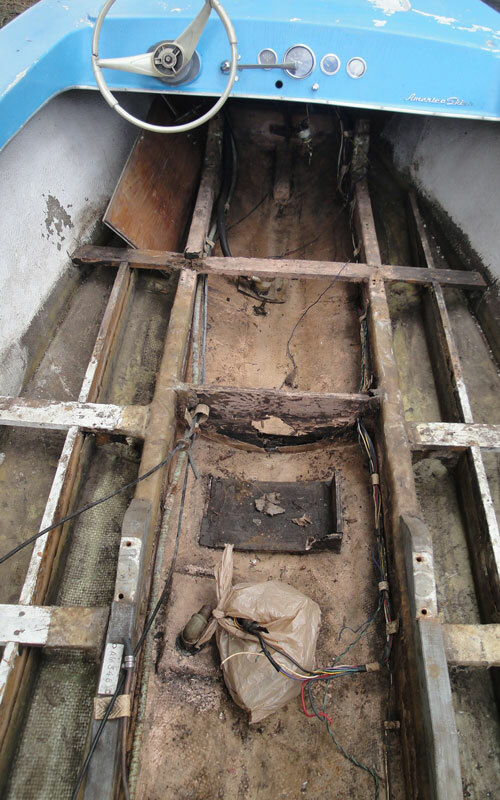 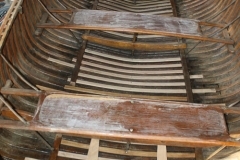 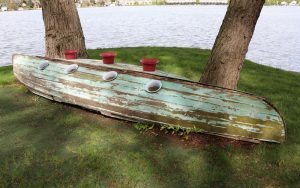 THANK YOU to Cindy Heaton for the great pictures and story – obviously unfinished – for there are still boats to be saved.